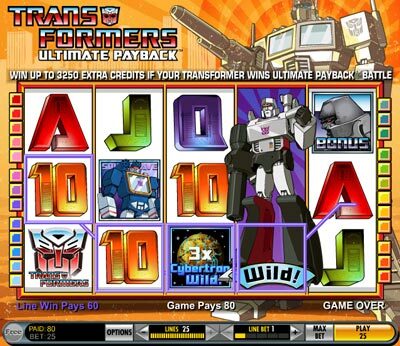 Transformers has got to be my favourite license used on a slots game so far. It is lovingly faithful to the 1980's cartoon/toys and (thankfully) not the modern day monstrosity by Michael Bay. 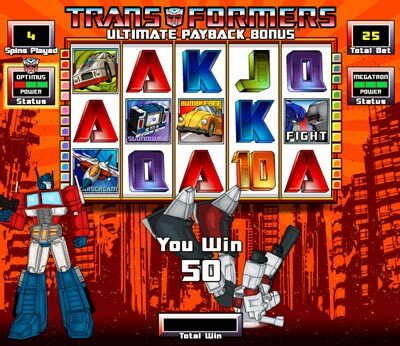 I love how the designers have used the original cartoon themes/music in this game and the special feature mini-game is a wonderful homage to the Optimus Prime vs Megatron showdown scene in the 1980's film. However fan service aside most importantly this game is extremely fun to play, it's loaded with wild symbols and features so you'll find yourself getting at least small wins frequently. In conclusion, this game was a joy to play and review, I whole heartedly recommend this extremely fun slots game especially to gamblers with some nostalgia for their classic childhood cartoon/toys. Like all five reel slots, payouts are valid on matching symbols from left to right (on a wagered payline). The Autobot and Decepticon wild symbols appear on the 2nd and 4th reels respectively, when spun in they expand to take up the whole reel making the whole reel(s) wild. The Cybertron wild functions both as a wild symbol and as a multiplier bonus. When it spins in on a payline you are given the chance to pick 1 of 3 mystery bonus multipliers (ranging from 2x to 10x) which increases your winning line(s) by that multiplier. Note this symbol only appears on the middle reel. 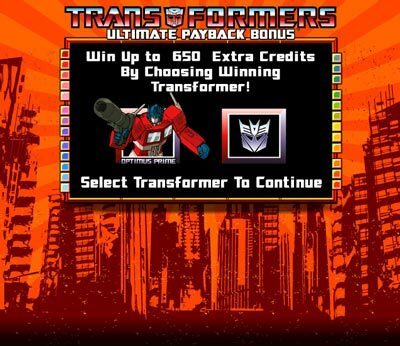 Activated by spinning both the Optimus Prime and Megatron bonus symbols into view (appearing on the 1st and 5th reel respectively). You are then taken to a great homage of the showdown between Optimus Prime and Megatron in the 1980's cartoon film quoting "one shall stand... one shall fall". The Ultimate Payback feature takes the form of a battle between them and starts by asking you to back one of them as the winner. 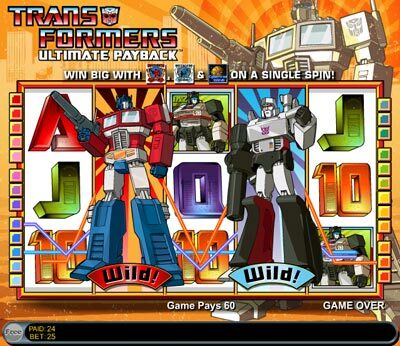 In the following screen, both robot leaders begin with a (3 point) life bar and you start to get free spins. Everytime a fight symbol appears the two robots fight with the loser, losing one lifepoint. You continue to get free spins until one of the robots is defeated. 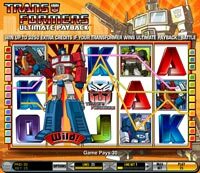 At the end you recieve the full amount of whatever was won during the free spins plus an additional bonus had you picked the winning robot.